If you're looking for a low key, isolated, jungle island hideout then Pangkor is for you. Its beaches attract locals from miles around on the weekend, but during the week you'll have them pretty much to yourself. And the village still has a fishing village feel, despite the 17th Century Dutch fort. But that doesn't mean the best places to stay in Pangkor aren't luxurious, if you want to hideout with every luxury then this is the place for it! As well as relaxing on one of a string of pretty, tranquil, white-sandy beaches, strolling around the three traditional fishing villages, and exploring the interior looking for pirate lairs, visitors to Pangkor get to enjoy some excellent seafood. You can also taste some of the dried seafood delicacies at Pangkor Town's market. Visitors might also enjoy a dive or two in the crystal clear waters, or a fishing trip? Pasir Bogak is the island's main beach and has a long, shallow entrance to the waters. So it's very popular, especially with families. It's also the best beach for watersports. If you fancy seeing more of the island you can hire bikes or motorbikes to tour the island's coastline. If you cycle at a relaxed pace it should take you around five and a half hours to circumnavigate. History lovers will enjoy a trip to the 17th century Dutch Fort (aka Kota Belanda), as well as Batu Bersurat - a mammoth stone carving with the sign of the Dutch East India Company as well as a number of other pieces of graffiti. Or, if you're into the religious life of Malaysia then check out the psychedelic Lin Je Kong Temple, the Hindu Temple or the Foo Ling Kong Temple (with its own miniature Great Wall of China!). Whilst the island is surrounded by lovely beaches, we'd recommend in particular Nipach Beach and Coral Beach - two serene and picturesque spots to enjoy an afternoon soaking up the sun. If you want to guarantee yourself a room in one of the best places to stay in Pangkor then be sure to book ahead. 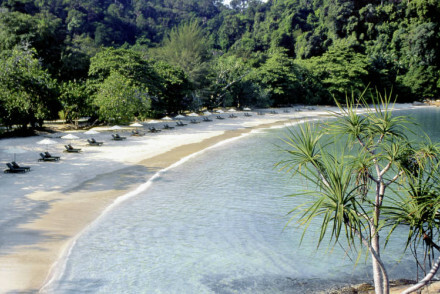 The Pangkor Laut Resort sits right up against a beautiful white sandy beach, surrounded by wildlife and crystal waters. There's enough space so that you'll feel as if you have your own private slice of paradise. An archetypal honeymoon destination. Tiger Rock can be even more private - it's got just eight domed villas, sleeping between three and ten people. But because of the size it's also the perfect place to host a tropical paradise wedding. Pangkor is always warm, boasting average temperatures above 27°C, however there are fairly heavy rains from November to February. However, due to its tropical location there's a fair amount of rainfall year-round. Just make sure to bring a light jacket and be prepared for the odd shower! Fly into Kuala Lumpur Airport, from where Berjaya Air have thrice weekly flights to Pangkor Airport. From the airport, hop in a taxi towards your final destination. Browse through our list of all the best places to stay in Pangkor Island. Alternatively, check out our other recommendations in Malaysia. A beach paradise on one the best beaches in the world. Surrounded by wildlife, white sand, crystal waters, and jungle. Contemporary chic villas with all the mod cons, enormous pools, an excellent spa and fantastic restaurants serving seafood. Your archetypal honeymoon destination. A gorgeous collection of 8 domed villas on stilts in a hilly jungle clearing with sea views. Each villa has a varied amount of rooms, sleeping 3 to 10 people. Authentic Malaysian decoration, DVD players, a lovely pool and decking area. An ideal spot for a wedding, for groups of friends, or families. Weddings - Ideal to rent out exclusively for a wedding. Families - The bigger houses are ideal for families.